We crossed into Portugal on the ferry across the wide Minho river which marks the northern border with Spain. We had woken to an overcast morning, but cliché or not, the sun came out as we landed on the Portuguese side. And it’s been shining since and is getting hotter … although thunder storms are forecast. The two countries are so close and sharing similar culture, and yet so markedly different. We have fallen in love with Portugal really quite quickly with its pretty picture book villages and charming people, and have discovered an expectedly rich seam of places we just have to see. How to pack them all into the relatively short time left now before our other ‘dates’? So far we have spent our first week in the northern Minho region, visiting Viana do Castelo and its famous church high on the hill at Monte de Santa Luzia. with tremendous views. 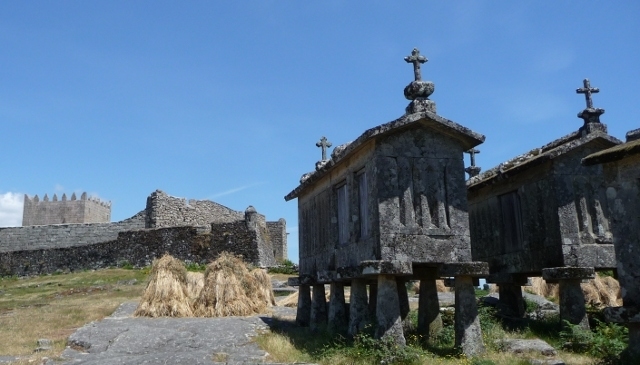 Also Valença – a delightful, if touristy fortified town with views across the Minho to Spain. We particularly loved Ponte de Lima and the Lima valley though so far. We camped up river from Ponte de Barca on the edge of the Peneda-Gerês national park for two nights in a tranquil foresty campsite overlooking the water and swapped travel notes with another English couple, John and Margaret, over white port. This reminded us that we hadn’t spoken to any other English people for several weeks. The market at Ponte de Barca drew us in with its local produce, ceramics and unbelievable amounts of unattractive clothing that no one seemed to be buying. Adrian braved buying meat in the old fashioned butchers shop without Portuguese. They don’t have the different cuts on view like we’re used to, but you have to ask for what you want and they cut it for you. A nice bit of beef for a Euro. We then headed up the valley to the village of Lindoso to see its impressive number of raised grain stores like tombs, particular to this area of Iberia and which we also saw in Galicia. We also explored its castle – strolling around its walls in the midday sun. 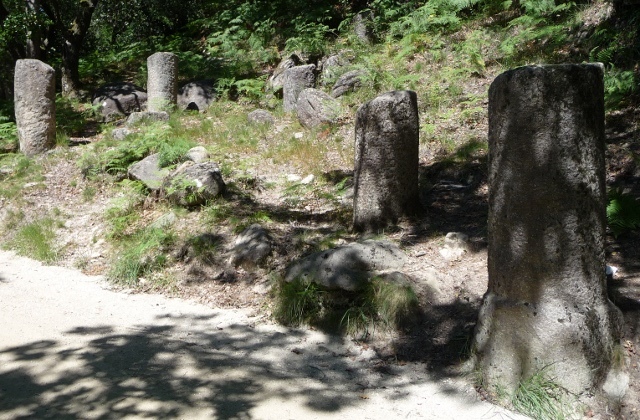 We continued on into the mountains of the national park close to the Spanish border and came across an intriguing but very rough track which was on the map and had road signs so we persevered, and after a while noticed clumps of Roman milestones along the road. We were on the Via Nova Roman road. Every time an emperor died the milestone with his inscription had to be replaced, but they left the old ones behind. 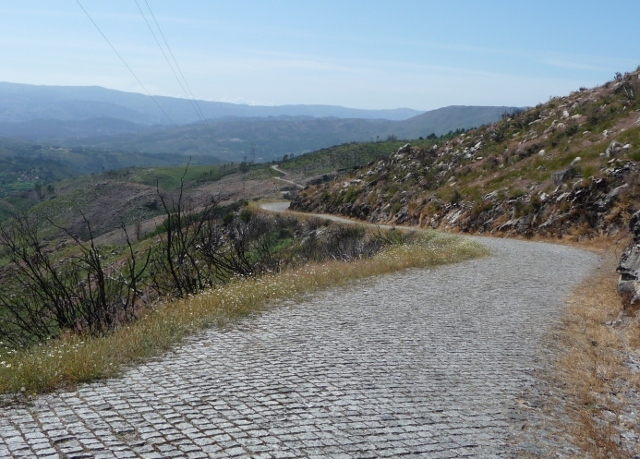 The road followed the edge of a reservoir above a gigantic dam (not there in Roman times) and then the road crawled higher and higher through tiny cobbled crumbly villages and over the top eventually bringing us back to our “home village” of Entre-Ambos-os-Rios. The following day we planned to move onto the city of Braga, but first were looking forward to market day at Barcelos – every Thursday. Supposedly one of the biggest regular markets in Europe. We were absolutely devastated that just this week, because it was a religious holiday for St John or St João in Portuguese, the market had been on Wednesday instead. They didn’t mention that in Rough Guide! Adrian’s post about the rest of that day follows.